This spring seven work groups, each with 6-8 members, will tackle common themes that emerged from the Heartside Quality of Life Study. Which work group will you join? City of Grand Rapids Heartside Work Groups Invitation We Need YOU! Heartside Work Group Info Sessions 2-Day Event April 11th – 12th, 2018 More Information Coming Soon! In September of 2017, in an effort led by the City of Grand Rapids, the Heartside neighborhood began engagement in a Quality of Life Study. 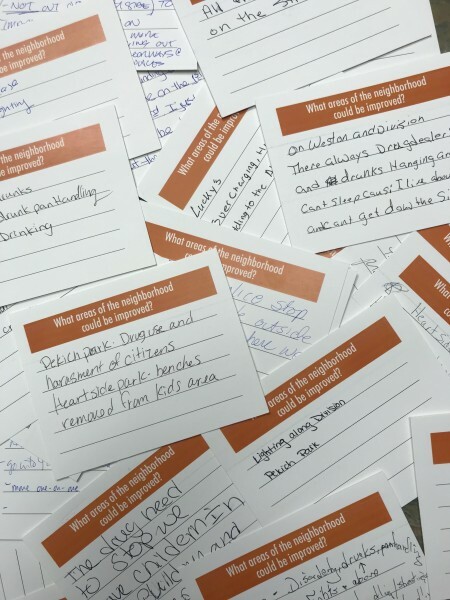 From September 2017 until January 2018, 200 of the community’s most involved residents and professionals participated in Quality of Life Listening Sessions where they were asked to voice their thoughts on the neighborhood’s strengths and opportunities for change. 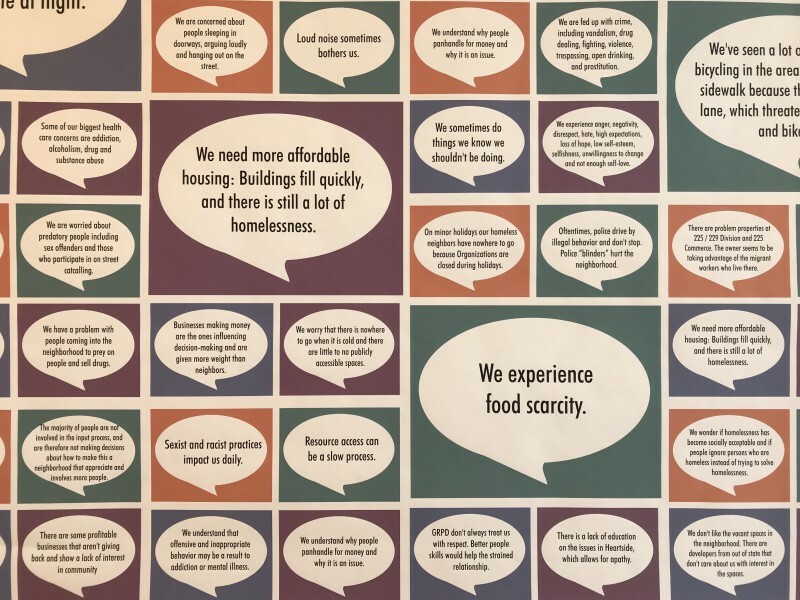 The purpose of the 14 listening sessions was to develop a unified voice for the vision of Heartside, a voice that represented all types of neighbors, not just those with traditional decision-making power. Once the data had been coded, it was examined by the Quality of Life Committee, which is comprised of several Grand Rapids planners from The City of Grand Rapids, Dwelling Place, Downtown Grand Rapids Incorporated, the Heartside Neighborhood Association, and the Heartside Neighborhood Collaboration Project. An even further distilled version of listening session data emerged, and was compiled by City of Grand Rapids Planning staff into several visual aid tools. The Neighbor Knowledge Exchange was the next important step in the Quality of Life Study. This was a large, 2-day event designed by Dwelling Place and the City of Grand Rapids to report back to residents about Listening Session data. Over 180 residents and community stakeholders were asked to engage in the process by voting on the comments that they agreed the most with. These feedback opportunities were measured and influenced the third phase of the Quality of Life Study, the formulation of Work Groups. There are two final opportunities for the public to get involved in the Quality of Life Study before the workgroups launch. The first event, called the Work Group New Member Orientation, is on March 14th from 11:30 to 1:30 at the Herkimer Community Room located at 309 South Division. 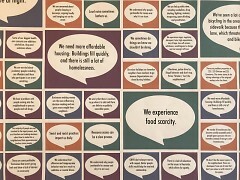 The second opportunity will be a two-day event on April 11th and 12th, and will be a formal introduction to the work group themes where community members will be asked to engage in solution-oriented conversations to kick off the work groups. It is vital that Heartside community members are active in this process. If you’re interested in being on a work group, contact Courtney Magaluk ([email protected]) or Latesha Lipscomb ([email protected]) from the City of Grand Rapids Planning Department. Because Dwelling Place is powered by volunteers, guest writers create our Rapidian content. Special thanks to Brian Molhoek for his contribution of this piece. Brian is an intern for the Learning Lab at the Avenue, Community Coordinator, musician, backcountry pack-mule and Hope College misfit.